A mother-daughter business in Columbia, Ill., is celebrating its first anniversary, thanks to its owners’ hard work and the expertise they received from the Illinois Metro East Small Business Development Center. Warm N Cozy Quilting, located at 235 North Main St. in Columbia, fills a unique niche in the world of quilting. Co-owners Debbie Chitty and her daughter, Danielle Cyvas, specialize in taking their customers’ works of art, in layers, and assembling them into one masterpiece courtesy of a 14-foot-long, long-arm quilting machine. Chitty and Cyvas sought out the SBDC and Interim Director Jo Ann DiMaggio May for advice in August 2015 when they decided to form a business based upon what they loved to do and were preparing for a September 2015 opening. In addition to finishing customers’ quilt projects, Warm N Cozy Quilting offers a generous selection of fabric, particularly specializing in polka dots, including kids’ patterns, Christmas print fabric, flannels and batiks. Chitty and Cyvas also teach quilting classes for three to five individuals at a time. DiMaggio May said helping the Warm N Cozy Quilting owners has been rewarding. “Debbie and Danielle are truly passionate and love their craft,” she said. “They are quite savvy business owners, and I look forward to their ongoing success. I can’t wait to assist them in expanding their operation”. Out of appreciation for the expertise they received from the Metro East SBDC at no cost, Chitty and Cyvas said it is their pleasure to refer others to the business counseling resource. Warm N Cozy Quilting is open Tuesday through Friday from 9 a.m.-5 p.m., Thursday night until 7 p.m. and Saturday from 9 a.m.-4 p.m. For more information, visit warmncozyquilting.com. The Metro East SBDC assists existing companies like Warm ‘n’ Cozy Quilting as well as new businesses headquartered in the nine-county Metro East region of Calhoun, Jersey, Madison, Bond, Clinton, St. Clair, Washington, Monroe and Randolph. It is a no-cost service to the community supported by the U.S. Small Business Administration, Illinois Department of Commerce & Economic Opportunity, and Southern Illinois University Edwardsville. 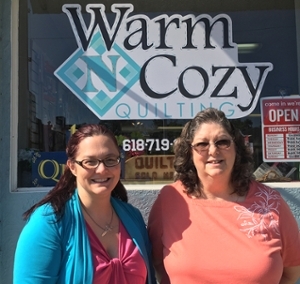 Photo (L-R): Warm N Cozy Quilting co-owners Danielle Cyvas and Debbie Chitty.